Harriet Lee Elam-Thomas is a former U.S. Ambassador to Senegal and herself a piece of Black history. Trailblazing US Ambassador reflects on her life and career as remnants of America’s ugly past resurface. NEW YORK – After a four-decades-long career at the U.S. Department of State’s Foreign Service including being appointed as U.S. Ambassador to Senegal in 2000, Harriet Lee Elam-Thomas is now looking back on her remarkable career and life. In time for Black History Month, her new memoir, Diversifying Diplomacy: My Journey from Roxbury to Dakar (Potomac Books, 2017), presents readers with insight into her work in diplomacy around the world along with firsthand accounts of a life spent breaking barriers as a Black woman growing up in segregated America. Through examination of her life, career and family tree, Elam-Thomas offers readers a unique glimpse of Black History during the days of Reconstruction, Jim Crow, segregation and beyond—and offers strategies for success in breaking through in any field. What this “hidden figure” in diplomacy has to say may be just what America needs during this divisive political era when old stereotypes are resurfacing, and Blacks and women again find they need to prove themselves. With Diversifying Diplomacy, Elam-Thomas has crafted a book that provides readers with a personal view of a bygone epoch of American history. Raised in a working-class family in Roxbury, Boston’s Black enclave, in the middle of the 20th century, she was encouraged from an early age to excel in all areas of life. With an older brother who ran a law practice with famed African-American U.S. Senator Edward Brooke and a grandfather who served as the first Black speaker of the house in South Carolina, Elam-Thomas did not lack for examples of greatness. As she traversed the globe and rose through the ranks of the Foreign Service, she never lost sight of those who had inspired and encouraged her during her early years and remained steadfast in the knowledge that in each nation she visited she was not only a representative of the United States of America, but also of her Roxbury community, of Black America and of women. As she worked to create peace, she also challenged the stereotypes that many carried about African Americans and women. Having defied the odds and reached career heights closed to many women and people of color at one time—with her appointment as U.S. Ambassador to Senegal from 2000 through 2002 serving as a true testament to the respect she earned in the diplomatic field—Elam-Thomas continues to work to bring the United States closer to its full potential as a nation offering opportunity to all. Currently the director of the University of Central Florida Diplomacy Program, Elam-Thomas works to create the next generation of diverse diplomatic leaders. Her efforts are directed at helping inspire people of color and women to break down new barriers in any field of choice. 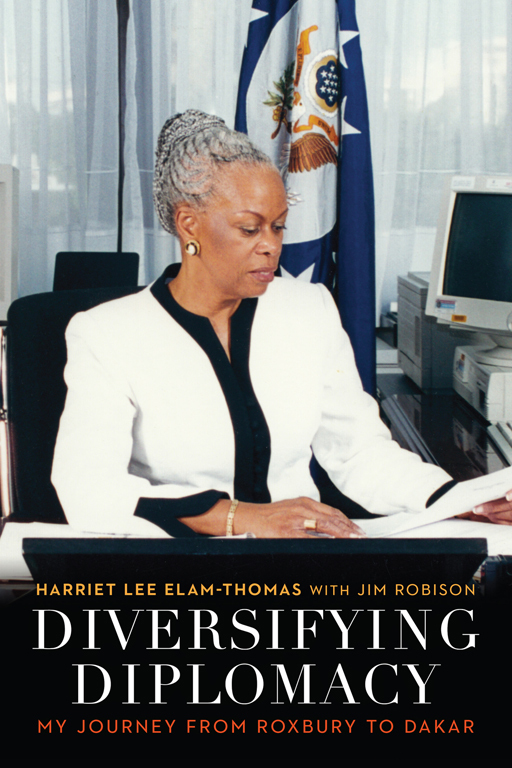 Diversifying Diplomacy: My Journey from Roxbury to Dakar, by Harriet Lee Elam-Thomas with Jim Robison, is available for purchase at most major retailers. Elam-Thomas has spoken across the country and around the world in venues and organizations such as Simmons College, Boston University, Spelman College, the University of Athens in Greece, The Zora Neal Hurston Festival, the Orlando Bar Association, the League of Women Voters, and more, and can speak on a variety of topics.